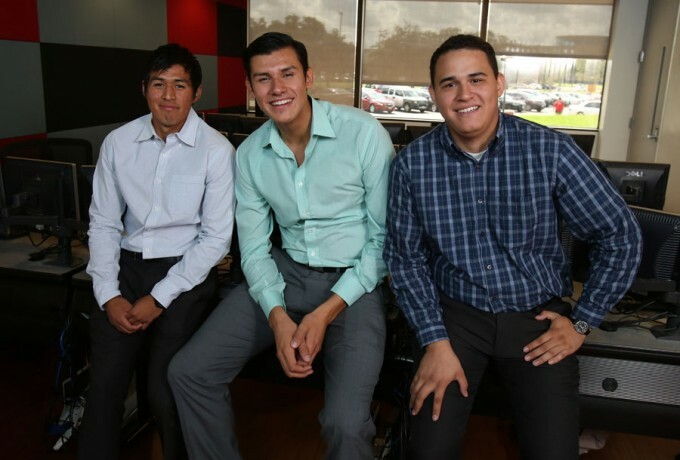 MIS seniors Cesar Gil (left) and Jose Pablo Ramirez Pradilla (center), along with UH-Downtown student Oscar Lara (right) won the Cleanweb Hackathon Houston for their CO₂ calculator app. Armed with a big idea and little need for sleep, students from the C. T. Bauer College of Business at the University of Houston took on the challenge of spending a weekend creating a mobile application that could change the world. Two students from Bauer College and another from UH-Downtown won the grand prize last month at the Cleanweb Hackathon Houston, held in late September at Rice University. The group, which included management information systems seniors Jose Pablo Ramirez Pradilla and Cesar Gil as well as UH-D marketing student Oscar Lara, competed against teams representing schools across the city to develop the best cleanweb application. The competition was part of a global series of Cleanweb Hackathon challenges, which require participants to create innovative visualization tools to show, track and compare spatial and time series data for urban sustainability and quality of life metrics with data provided by the Shell Center for Sustainability, Houston Sustainability Indicators Project. The team’s visual approach impressed judges. Each member of the team had a specific function — Gil served as the business team member, helping with design and formulating the idea. He also brought together the other two team members. Ramirez Pradilla was the group’s developer, putting together the carbon calculator and making sure it could access Google Maps for distance calculations. Lara’s role was team designer, conceptualizing and designing graphics for the app, and building the website to showcase during the competition presentation. A panel of judges, including Houston METRO Chief Information Officer Randy Frazier, evaluated each group’s presentation and prototype demo on functionality, beauty and scalability. Focusing on those three elements proved to be the formula for success for the group, Ramirez Pradilla said. 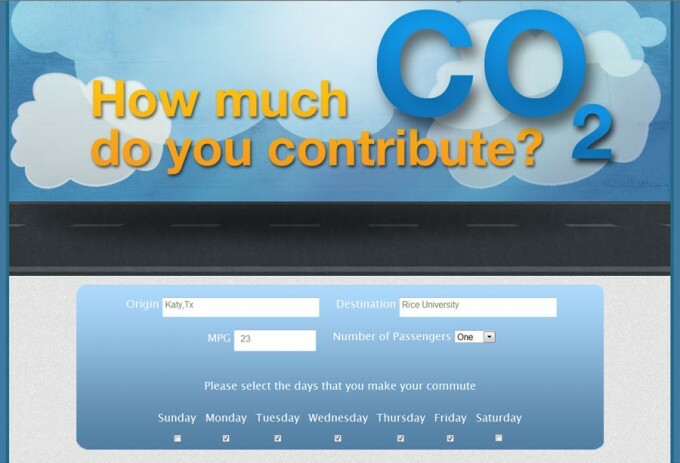 Although the group developed only a working prototype for the competition, it could have significant real-world implications, Ramirez Pradilla said, linking with car data to help drivers determine which car is best suited for their commutes, or as a way to challenge employees or students to reduce their carbon footprint. The fast pace of the competition coupled with the creative and collaborative atmosphere gave participants a glimpse into what working in the technology industry might offer after graduation. Both Gil and Ramirez Pradilla have taken courses at Bauer that gave them knowledge to apply in the competition, including Panahi’s mobile app development course, where they learned to write code. “I like working with mobile applications because it combines creativity, technology and entrepreneurship all together,” Gil said. Each of the team members plans to work professionally in the industry in some capacity — Gil with mobile apps, Ramirez Pradilla with technology development in Latin America, and Lara in graphic design and web development. “The most important thing I got from this competition was confidence, and the fact that you have to give it a try,” Ramirez Pradilla said.